In hindsight I'm not so sure whether this was the best subject to pick for one of my ten days. Looking at my screenshot folder, I was reminded that many of the little cut scenes that I enjoyed the most didn't actually result in any screenshots simply because print screen refused to work, or I was so engrossed in the game that I didn't remember to press the button in time. Still, there is something. This isn't a very good quality screenshot - part of the UI is visible, it's very dark, and I didn't actually catch exactly the moment I wanted, but it's still a very good representation of what I love about the little cut scenes in the game. It's from the quest Fall of the Locust, which is a Republic side heroic on Taris that is more story-heavy than most heroics. 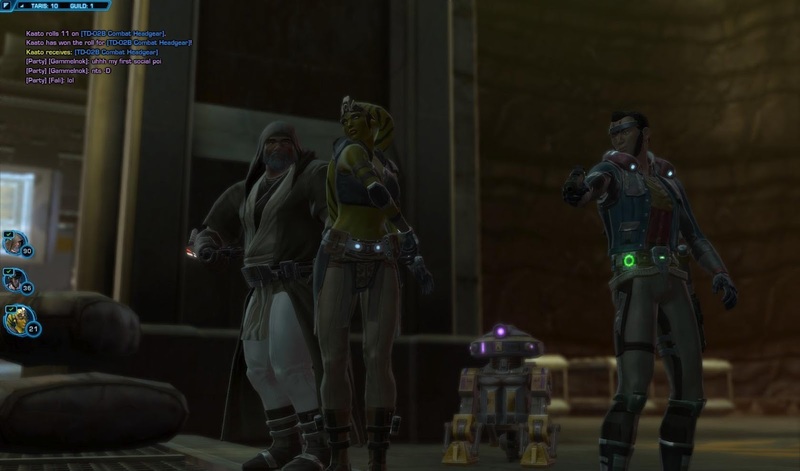 It had already gone grey by the time I did it on my Jedi knight, but I volunteered to help out two other people that were looking for a group simply because I remembered enjoying this quest very much on my Sage. In fact, my high level ended up being a good thing because we couldn't find a healer at the time, so it was handy to have a tank who took virtually no damage. Anyway, I love this little scene because it has the entire party slowly drawing their weapons at the same time as they encounter a threat, and it really drives home the feeling that you're this strike team that's on a dangerous mission together. Even if I never see that fat bearded Jedi and the dodgy smuggler again, we had something memorable going on when we rescued that twi'lek agent and then proceeded to take care of a dangerous pirate together. And for something slightly different, my first Imperial side screenshot on this blog! This was when my boyfriend and I unsuccessfully tried to duo the Foundry. We didn't make it past this guy, but I was very impressed with the light show. 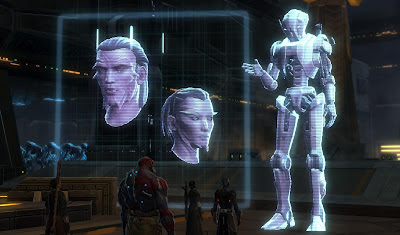 More enemies should have giant holographic presentations of themselves give illustrated speeches about their devious plans. "We didn't make it past this guy, but I was very impressed with the light show." This guy?! THIS GUY?!!?! DIE ORGANIC MEATBAGS! I just about stroked out when I read that. How can you not know the glorious story of HK-47? "Observation: I am a droid, master, with programming. Even if I did not enjoy killing, I would have no choice. Thankfully, I enjoy it very much." Lol, have I mentioned that I never played Knights of the Old Republic?